If immersion is the first thing that comes to mind when planning a trip — or if you travel for enrichment and adventure — then Viking’s River Cruises is the perfect choice. That was certainly the case during a 12-day Viking River Cruises City of Lights itinerary, which offered that and more. 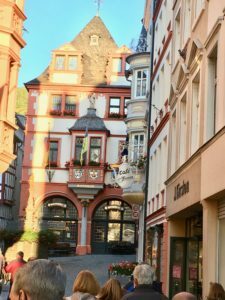 During each visit — Trier, Bernkastel-Kues, Cochem, Koblenz, Heidelberg, Mitenberg, Wurzburg, Bamberg, Nuremberg and finally Prague — the itinerary included comprehensive tours of the area and extra-cost options that were well worth the money. Forget iPhones. The QuietVox receiver with an earbud is my new favorite device. The technology allows a wearer to roam freely when visiting sites, while staying in contact with the guide conducting the tour. No straining to listen or huddling in one big group; the battery-operated receiver, which can be charged overnight from a base in your cabin, contributes to the immersion experience. Since the Moselle Valley is the oldest wine region in Germany, this oenophile couldn’t resist putting her new favorite toy to use during an optional walking and wine tour in Bernkastel-Kues. As we maneuvered our way through narrow, cobblestone streets and some rather steep inclines, we wondered why many of the half-timber homes were leaning. Our guide explained that this can occur when cheaper, green wood is used. We also learned the charmingly odd-shaped houses were skinnier at the base and bulged at the top because taxes were based on the size of the ground floor. After working up a thirst, we headed over to a wine tasting at the 150-year-old winery, Weingut Dr. Pauly-Bergweiler. The brick, barrow-shaped wine storage room with its crystal chandelier and rustic wooden tables was the perfect atmosphere for the Riesling tasting. 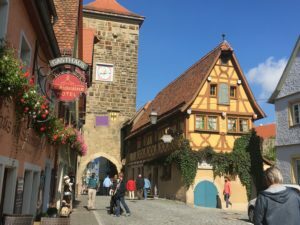 If you pick only one optional tour in Germany, choose a visit to Rothenburg ob der Tauber when the ship docks in Wurzburg. 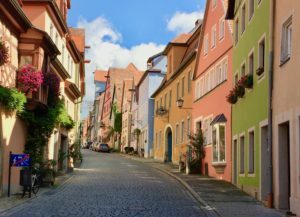 The bus trip is a bit long, but the picturesque scenery along Bavaria’s “Romantic Road,” is captivating. 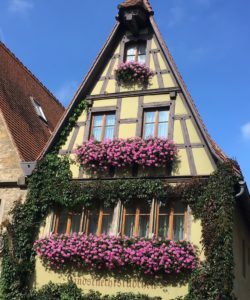 Timber-framed houses feature flower boxes bursting with color. 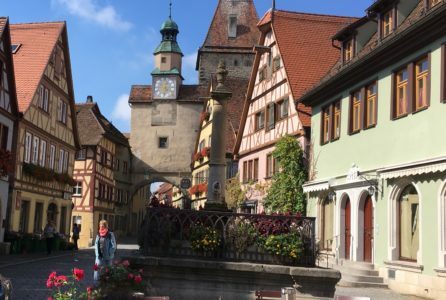 While so many German towns were ravaged by war and time, this perfectly preserved, walled medieval gem offers a time-warp that tickles the imagination. Those lucky enough to live there might find it challenging to drive through those cobblestone narrow lanes, but visitors will discover treasures everywhere they look: timber-framed and stucco houses with flower boxes bursting with colorful arrangements; an old Jewish section; a majestic, Renaissance-style town hall in Market Square; a plethora of museums that pay tribute to toys, criminals and Christmas; a busy market area where bakeries that sell a regional favorite called Schneeball (snowball) made from shortcrust pastry mingle with high end fashion shops; and a breathtaking castle garden, perfect for picnics or strolls. By the way, I’d skip the Schneeball, which looked better than it tasted (it was dry and flaky). 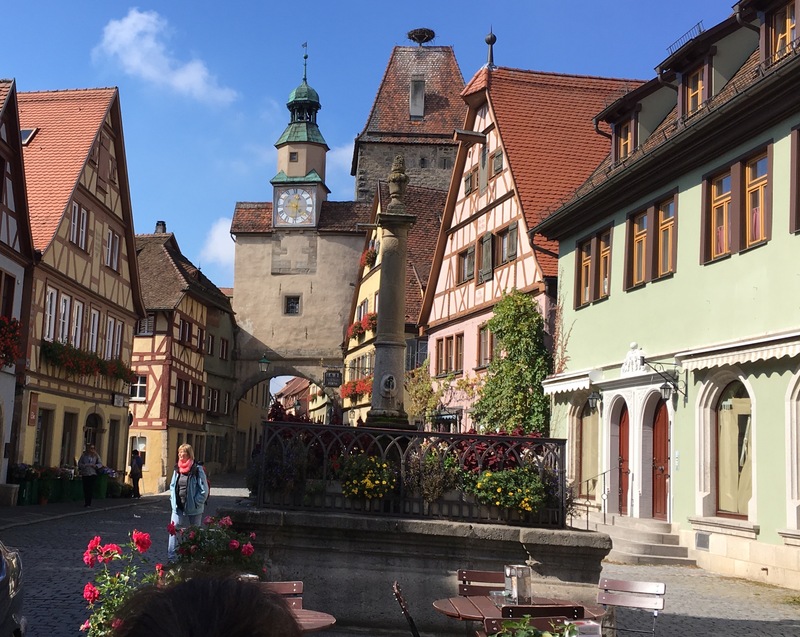 During an included tour of Heidelberg, Germany’s oldest university town, early education student Nathalie joined us for lunch at a restaurant for local cuisine and informative conversation. 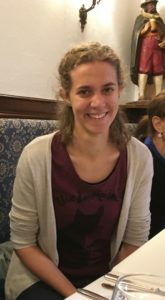 Nathalie said she loves practicing her English and we gave her plenty of opportunity by peppering her with numerous questions about her family and student life in Germany. Whether it’s lunch with a student in Germany, enjoying Dutch hospitality with a local family, or even a visit to a village school along the Mekong, a Viking a spokesperson said immersive experiences are offered on many of their itineraries. 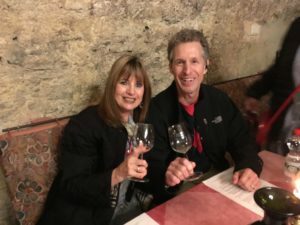 While the itinerary includes two days in the historically, rich Czech Republic city of Prague, we had the equivalent of one full day since we were scheduled to fly home early on the second day. The included bus/walking tour gave us a jam-packed, rudimentary glimpse that made us wish we had extended our stay, an option Viking offers. 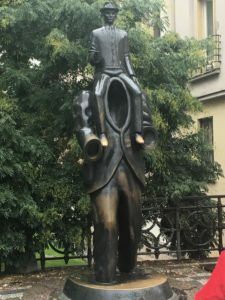 Statue of Franz Kafka by Jaroslav Róna is based on a scene in Kafka’s novel, Amerika. As our guide provided a running commentary when we walked through the Jewish section, I longed to venture inside an old synagogue that listed Jews who died in the Holocaust and visit the largest Jewish cemetery in Europe, with burials dating back to the 15th century. 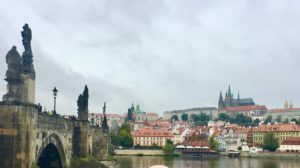 When we strolled across the Charles Bridge — opened in 1402 — that crosses the Vltava River — I yearned to stop and listen to the classical violin music performed by street musicians. After a tour of Old Town, which included a viewing of the 15th century Astronomical Clock, with intricate moving sculptures that perform a mesmerizing show on the hour, we did have a bit of free time. Yet, we found ourselves rushing around to meet up with our group at the pre-arranged hour. One should explore Old Town at a leisurely pace — or to sit at an outdoor café to people watch with a cup of coffee and a regional favorite spit cake called trdelník (rolled dough that is wrapped around a stick, then grilled and topped with a sugar and walnut mix). Astronomical Clock performs a mesmerizing show on the hour. A private concert that featured selections from Haydn, Mozart, Beethoven, Schumann and Dvorak. I highly recommend the optional excursion, Privileged Access: Lobkowicz Palace, where visitors explore the palace while listening to an audio guide narrated by members of the Lobkowicz family, who sprinkle their talk with anecdotes from the family’s 400-year history. 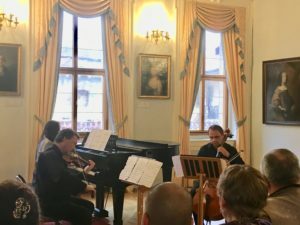 The package includes a goulash lunch in a banquet hall and private concert in the baroque concert hall where we listened to Haydn, Mozart, Beethoven, Schumann and Dvorak. As patrons of art and music, the family gathered an impressive collection that resulted in some jaw-dropping moments including paintings by Rubens, Canaletto and many more, and musical manuscripts by some of the most celebrated composers in history such as Mozart, Beethoven and Haydn. Josef Frantisek Maxmilian, the 7th Prince of Lobkowicz, funded composers such as Haydn and struck up a friendship with and became a benefactor of Beethoven, whom he financially supported, allowing him the freedom to work on his music. Beethoven dedicated a number of pieces to the prince. The Lobkowicz collection includes manuscripts by some of the most celebrated composers in history such as Mozart, Beethoven and Haydn. 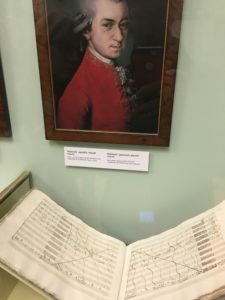 We spent a good part of the tour gazing at manuscripts that included Beethoven’s Fourth and Fifth symphonies and Handel’s Messiah marked up with red ink annotations by Mozart for his own 1789 re-orchestration. It was one of the highlights of the trip. Viking makes river cruising accessible to just about every physical level. It offers a variety of included and optional excursions, each categorized by activity level (easy, moderate and active). Marksburg Castle could be challenging to navigate. There were some excursions that were a bit challenging, such as the included tour of 13th century Marksburg Castle in Koblenz. 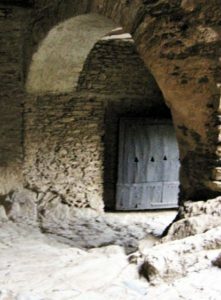 While the structure gives visitors a realistic experience of medieval life — it had a perfectly preserved kitchen, toilet right off the dining room and grizzly torture chamber — the rocky, uneven floors and steep and numerous stairways caused concern for the less fit among our group, who were clearly struggling. So, I would take seriously the notations of activity levels. And, if you do have limitations, you might want to visit the information desk onboard to ask about specific tours.